Modern musical romance La La Land has scored a record 14 nominations for this year’s Oscars. Ryan Gosling and Emma Stone are up for best actor and actress for their roles in the movie. La La Land is also one of nine movies up for the best picture award. Arrival and coming-of-age drama Moonlight have eight nominations each, with the latter’s citations including a supporting actress nod for Naomie Harris. Naomie Harris, who plays Miss Moneypenny in the James Bond movies, said she was “over the moon” and “couldn’t be more thrilled”. La La Land‘s 14 nominations puts it on the same footing as All About Eve and Titanic, which both received 14 nominations in 1951 and 1998 respectively. It is now the most nominated musical in Oscar history, having topped the 13 nods Mary Poppins received in 1965. Damien Chazelle is nominated both for his direction and original screenplay, while his movie has two nominations in the best song category. 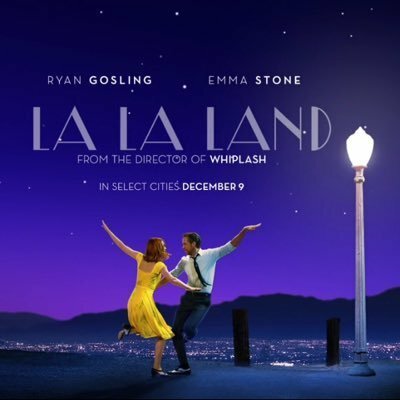 La La Land, which received 11 BAFTA nominations earlier this month, gets additional nods for its score, editing and cinematography. It is also shortlisted for its costume and production design and for its sound editing and mixing. Ben-Hur, Titanic and the third Lord of the Rings movie share the record for Oscar wins, having each won 11 awards. Fences, Hacksaw Ridge, Hell or High Water, Hidden Figures, Lion and Manchester by the Sea join Arrival, La La Land and Moonlight on the best picture shortlist. Meryl Streep gets her 20th Oscar nomination, in the best actress category, for her role in Florence Foster Jenkins. Natalie Portman, Ruth Negga and Isabelle Huppert are also in contention for their roles in Jackie, Loving and Elle. Previous Oscar winners Nicole Kidman and Octavia Spencer also receive nominations for Lion and Hidden Figures. Lion tells the true story of an Indian-born man who, having been adopted and raised in Tasmania, uses Google Earth to find the family he was parted from as a child. In a statement, Nicole Kidman thanked AMPAS (Academy of Motion Picture Arts and Sciences) “for all of the acknowledgements you have given this heartfelt film”. Moonlight‘s Mahershala Ali, Manchester by the Sea‘s Lucas Hedges and Hell or High Water‘s Jeff Bridges are also up for best supporting actor. The line-up is completed by Michael Shannon, a surprise nominee for his role as a grizzled sheriff in Nocturnal Animals. Many had expected Aaron Taylor-Johnson to be nominated following his triumph at the Golden Globes earlier this month. If Damien Chazelle wins best director, he will be the youngest person ever to receive the award. Mel Gibson is also up for the director prize, as is Arrival‘s Denis Villeneuve, Moonlight‘s Barry Jenkins and Manchester by the Sea‘s Kenneth Lonergan. Non-white talent is well-represented in this year’s acting nominations, with at least one non-white actor included in each of the four categories. This contrasts with 2015 and 2016’s nominations, which were criticized for having all-white line-ups in the acting categories. Jimmy Kimmel will host this year’s Oscar ceremony on February 26.